The Northern Harrier and female Hen Harrier performed well once again as did 2 female Merlins in an impressive areal tangle. Further exciting birds included a Peregrine, drake Smew, juvenile Glaucous Gull and either the reappearance or new discovery of a 2nd winter Iceland Gull sheltering from the strong westerly wind by the pier. Modest counts of commoner birds include 3 Red-throated Divers, 4 Grey Herons, 4 Pintail, 17 Shoveler, 3 Long-tailed Ducks and the highest count of Golden Plover of the year, standing at 540 birds. 30 Bar-tailed Godwits and 3 Tysties rounded off the day. The lingering pairs of Mute Swan and Whooper Swan were both still present along with a sole Pink-footed Goose. The first 2 Shelduck of the year were a welcome sight as were several lingering scarcities including 4 juvenile Glaucous Gulls (and a freshly deceased adult), a 2nd winter Iceland Gull and the lingering adult male Northern Harrier (performing well as is often the case). 9 Twite outside the observatory, the lingering drake Smew, 4 Goldeneye and 7 Long-tailed Ducks sheltering on the east coast made for a productive day. A half hour seawatch off Dennis Head in the morning produced 4 Red-throated Divers, 3 Great Northern Divers, 24 Kittiwake, and a trickle of auks including 14 Guillemots, 2 Razorbill and 15 auk sp. Noteworthy species were much the same as the previous few days and included 2 Mute Swan, 2 Whooper Swan, Shelduck, 8 Pintail, Smew, 2 Red-breasted Mergansers, Northern Harrier, 2nd winter Iceland Gull, 2 juvenile Glaucous Gulls, 7 Twite and 2 Snow Buntings. Notable high counts involved 86 Ringed Plover and 106 Dunlin feeding together on the East Links. Some long awaited White-fronted Geese finally appeared on the island following a blank year in 2016. Following an arrival of birds on Shetland we eagerly anticipated an arrival for ourselves. A small flock of six birds (including 3 juveniles) were found near Ancum Willows before relocating to the fields near Waterhouse were they were loosely associated with flocks of Greylag Geese. 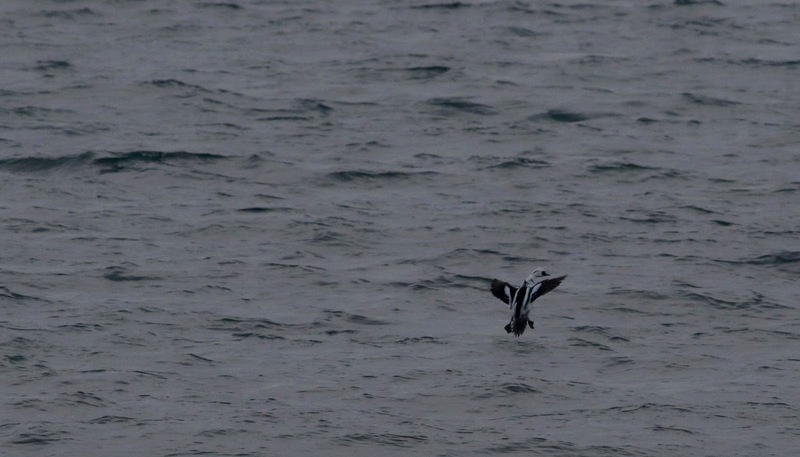 Modest high counts for the day include 109 Shag, 121 Wigeon, 75 Teal, 30 Long-tailed Duck, 5 Goldeneye and 5 Tysties. It has been somewhat busy again with a nice diversity of birds picking up nearer the end of the month. Larissa Simulik and Samuel Perfect returned to the observatory on the 24th to join George Gay who has been present for several weeks already. With a boost in island coverage, some noteworthy highlights have already been unearthed. There was little coverage on the 21st but the 22nd produced a good total of 10 Red-throated Divers, 7 Great Northern Divers, 4 Pintail, Northern Harrier, Peregrine, a 2nd winter Iceland Gull and 13 Redwing. Coverage commenced once again on the 24th with highlights including Red-throated Diver, Green-winged Teal, 14 Mallard, 2 Long-tailed Duck, 3 Goldeneye, Peregrine, 250 Golden Plover, 75 Herring Gull and 9 Twite. The 25th yielded the highest totals for several days for many species, particularly wildfowl thanks to the additional coverage. General highlights include Northern Harrier, 6 Glaucous Gulls (3 juveniles, 1 2nd winter and 2 adults) joining a flock of 90 Great Black-backed Gulls, the first 2 Black-headed Gulls of the year, Water Rail and Red-throated Diver and 2 Tysties. The aforementioned wildfowl included 99 Wigeon, 4 Gadwall, 80 Teal, 17 Pintail, 8 Shoveler, 12 Tufted Duck, 41 Eider and 4 Red-breasted Merganser. Further noteworthy counts include 53 Oystercatcher, 126 Lapwing, 42 Purple Sandpipers, 35 Dunlin, 10 Snipe, 35 Curlew, 38 Redshank. 17 Blackbirds and 2 Fieldfare and a Chaffinch were the passerine highlights. Jack Snipe, 31 Wigeon, 2 Long-tailed Duck, Red-breasted Merganser and 82 Lapwing. 2 Jack Snipe, 13 Snipe, 164 Wigeon, 38 Teal, Long-tailed Duck, Goldeneye, 2 Red-breasted Merganser, 14 Ringed Plover and 3 Grey Herons. Jack Snipe, 9 Pintail, 17 Shoveler, 2 Red-breasted Merganser, Hen Harrier, Northern Harrier (interesting to note a dead and plucked Moorhen on the day it reappears as we suspect they are popular prey), 39 Ringed Plover, 2 Purple Sandpipers, 41 Dunlin, 2 Skylark and 2 Robin. It has been a busy time with many guests at the observatory. Writing the report and general upkeep is consuming most of our time and with precious few staff it is a struggle to invest much of our time in the field birding. Strong winds battering the island also make the task of counting and identifying birds as they are buffeted about a great deal harder. However, three days of bird counting were achieved by one hardy staff member. 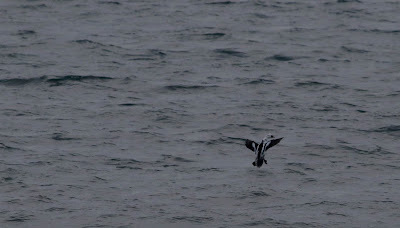 Highlights from the 9th include 4 Red-throated Divers, 2 Great Northern Divers, 3 Red-breasted Mergansers and a Tystie. Wildfowl included modest totals of 73 Wigeon, Goldeneye, 3 Long-tailed Ducks. 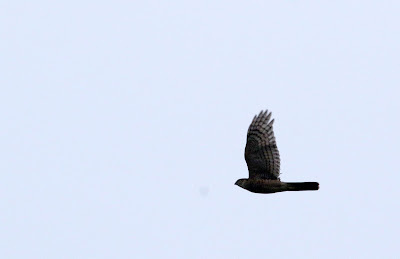 An assortment of other noteworthy species included the lingering female Hen Harrier, 2 Peregrines, 61 Purple Sandpipers, 15 Snipe and a single Woodcock. 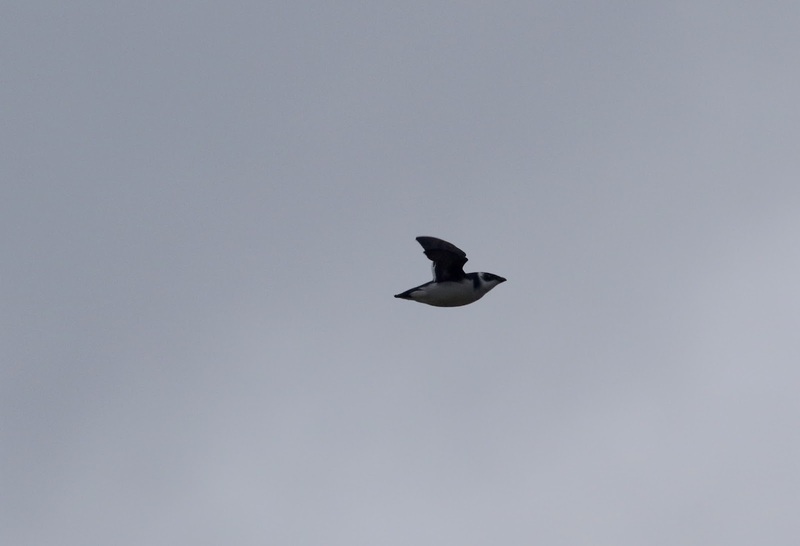 Highlights from the 12th included 5 Red-throated Divers, 1 Great Northern Diver, 2 Mute Swan, 3 Whooper Swans, 8 Goldeneye and rather surprising a bonus Pomarine Skua seen on an hours seawatch from Dennis Head. The 15th was dedicated to a WeBS (Wetland Bird Survey) count. Wildfowl totals from the entire island amounted to a impressive total of 1399 birds including 15 species represented by: 2 Mute Swans, 2 Whooper Swans, 2 Pink-footed Geese, 834 Greylag Geese, 284 Wigeon, 4 Gadwall, 121 Teal, 91 Mallard, 16 Pintail, 11 Shoveler, 17 Tufted Duck, 9 Eider, 2 Long-tailed Duck, 2 Goldeneye and 2 Red-breasted Merganser. Additional waterbirds included singles of Red-throated Diver, Great Northern Diver, 14 Moorhen and 27 Coot. Wader totals came to 14 Oystercatchers, 13 Ringed Plover, 218 Golden Plover, 44 Lapwing, 37 Purple Sandpipers, 2 Dunlin, 1 Jack Snipe, 16 Snipe, 37 Curlew, 23 Redshank, 53 Turnstone. An assortment of other species: 1 Merlin, 12 Rock Doves, 6 Rock Pipits, 3 Robins, 1 Fieldfare, 5 Redwing, 164 Starling and 9 Twite. It's been much of the same up here, but that's winter birding I suppose! 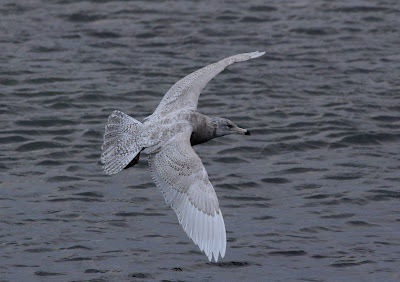 A single Iceland Gull flying along the West side of the island was the only bird of noteworthy accreditation on the 6th. The 7th bought a break in what has seemed relentless wind and showers, it bought another first for the year, but again not hugely exciting, it came in the shape of a pair of Razorbill seen heading west from Westness, other noteworthy species for the day were 10 Goldeneye, 6 Pintail, 12 Bar-tailed Godwits and the ever present Northern Harrier still terrorising the aforementioned ducks! The 8th saw a return to the nasty weather, this time it was squalled showers and mist, this meant visibility was rubbish for the majority of the day, which by the way aren't very long at the moment! Surprisingly the drake Smew was back on Bewan with a flock of 6 Goldeneye, the Northern Harrier did its best to sneak up on the observatory staff, as it has done on many occasions this year and last, shooting past without detection until you see the back end of it hawking around the now empty loch where the ducks you were watching once fed. 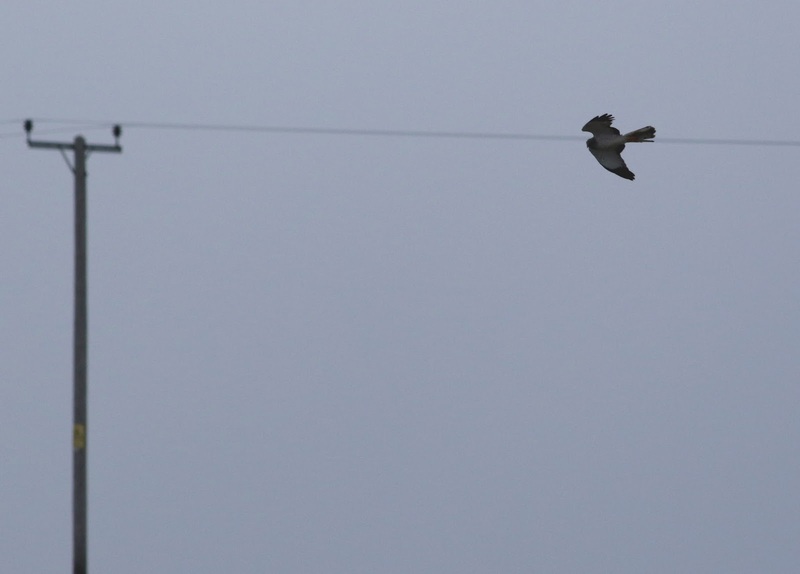 The other bird of note was also a newbie for 2017, a smart female Sparrowhawk was seen flushing from the trees in Holland to draw the day to a close. 31st December - 5th January. We're Back! First and foremost we hope you all had a great Christmas and a Happy New Year and it's now time to get some birding done. 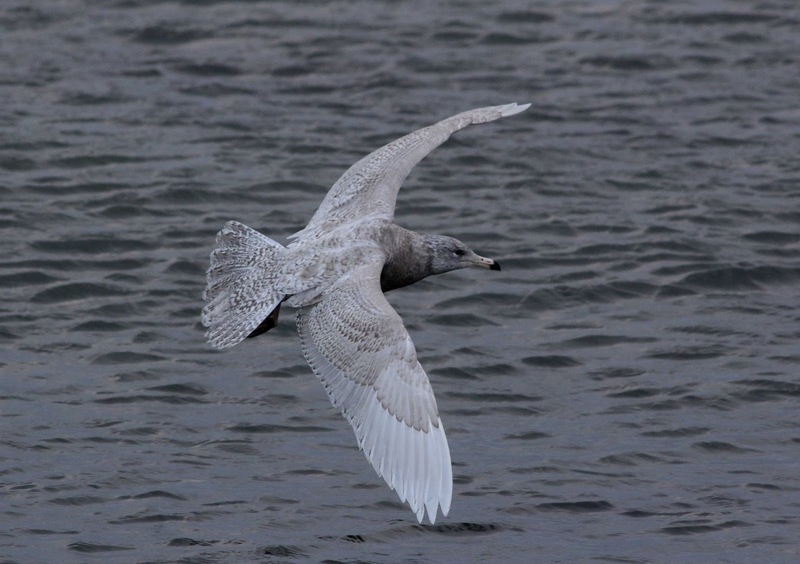 The 31st bought about strong winds, something that has been a constant feature since the start of December, the Northern Harrier is still around and has been entertaining us over the winter period, as have a pair of Glaucous Gulls that have been hanging around the loch at Bewan. 5 Pink-footed Geese at Peckhole, a Pochard on Brides and Merlin rounded off the final day of 2016. Hogamany provided good entertainment and with drinks flowing a first foray into the field wasn't likely the following day, so we'll move on to the 2nd and not mention whiskey for a while! The day started with a female Chaffinch trapped in T1, the first bird ringed on island in 2017.Another trip to Bewan and a flock of 6 Goldeneye were accompanied by a very surprising and very smart Drake Smew, the year was off to a good start and it didn't stop, 7 Snow Buntings at Brides provided a nice addition as did 3 Merlins in different locations, last but not least an Iceland Gull was seen flying round Nouster. A dazzling session in the late evening produced, Moorhen, Gadwall, Whooper Swan, Purple Sandpiper, Turnstone, Common Gull and a Great-black Backed Gull rounded off a good day of birds. The two Glaucs were present again on the 3rd as was female Hen Harrier and the 4th bought another Glaucous Gull this time on the beach at Brides along with a lone Snow Bunting at Stromness point and the Northern Harrier showed well at Kirbest and the obs. The 5th saw a slight let up in the wind, the Northern Harrier was hanging around the gardens at Holland and a Little Auk was heard and then seen flying over the road between the obs and Holland, the Chaffinch was seen around the obs and 3 Robins rounded the day off nicely.